Today’s demanding business challenges require long-term Financial Performance Management solutions that not only deliver immediate benefits, but also provide the agility to capitalize on future opportunities. How can you tell how profitable your business is? How does this year’s performance compare to last year’s? Is your business growing? How are you faring in comparison to your competitors? Answers to questions such as these provide critical financial measures for organizations – indicators that should be monitored regularly and used as a basis for decision making and planning. 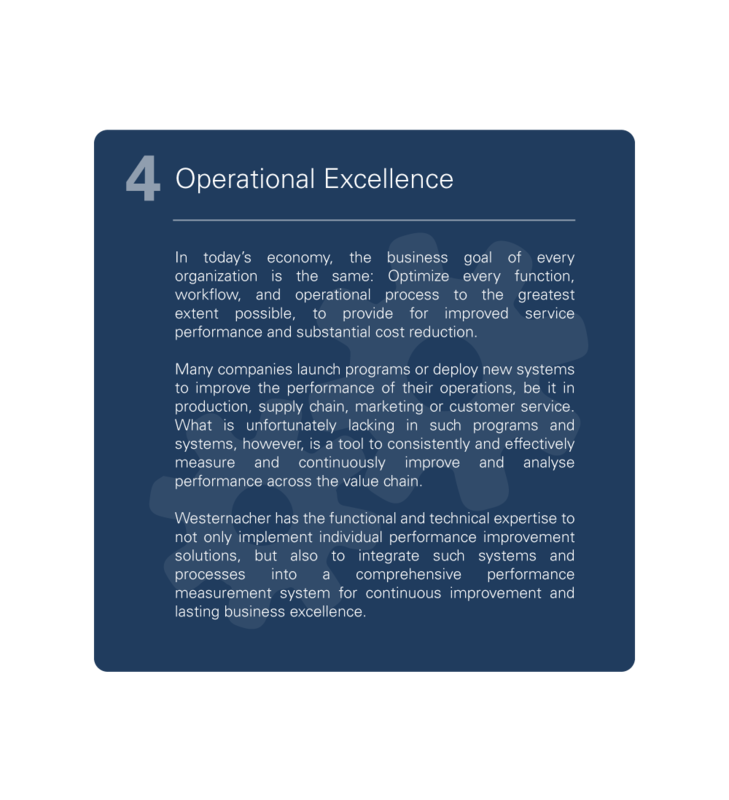 These measures are gauges of production, efficiency and effectiveness relating to operating procedures and costs, and provide important information concerning business profitability and function in multiple areas. 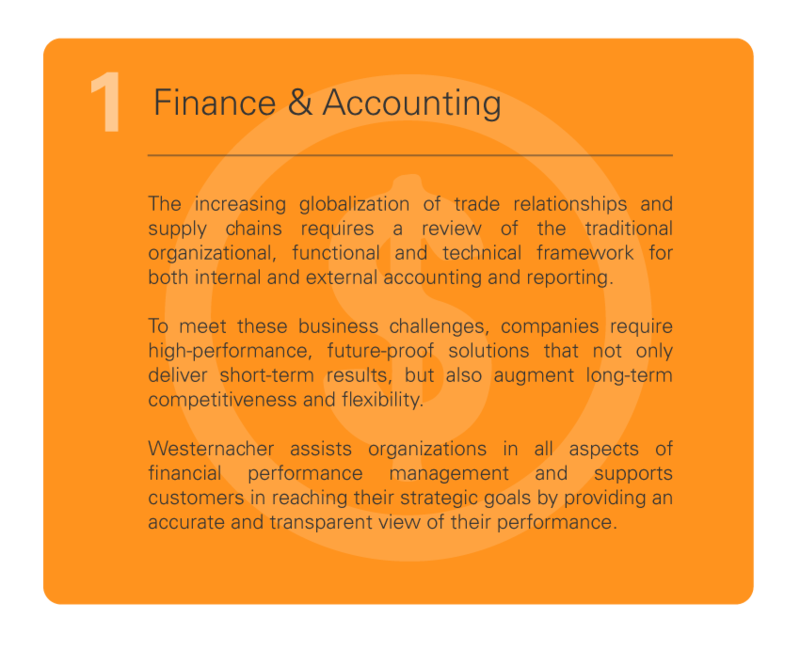 Westernacher advises clients in all aspects of Financial Performance Management, helping them to transform their business vision into profitability. Whether your goal is to lower costs, improve efficiency, or keep up with today’s rapidly changing technology, our highly qualified and experienced consultants can help you to dramatically improve your financial performance. Our functional focus is on our clients’ internal and external accounting and financial reporting, profitability management and operational excellence. Our specialized consultants use an innovative approach, combined with a healthy dose of pragmatism in order to accelerate the changes that enable your business to operate most productively. Since 1969, our clients have considered us trusted advisors and business partners. Our consultants have helped global clients receive tangible benefits through a better understanding of their financial position and a clear picture of company performance. Westernacher’s unique blend of financial, business and technical skills enables us to provide a full range of financial profitability management solutions. We help organizations to dramatically improve business processes and strengthen internal controls through greater access to accurate and reliable financial information and continuity of financial data. As an integrated component of SAP ECC, Enterprise Asset Management EAM supports all processes of Asset Lifecycle to ensure the availability of production facilities, plant and machinery effectively, efficiently and sustainably. Thus SAP EAM directly contributes to securing your production readiness and thus makes an important contribution to your company’s results. Reducing operational costs and risk, while ensuring required asset uptimes are the key challenges for asset-intensive organizations today. Enterprise Asset Management extend beyond physical equipment and also include human and information assets, since these have significant impact on the performance of assets. 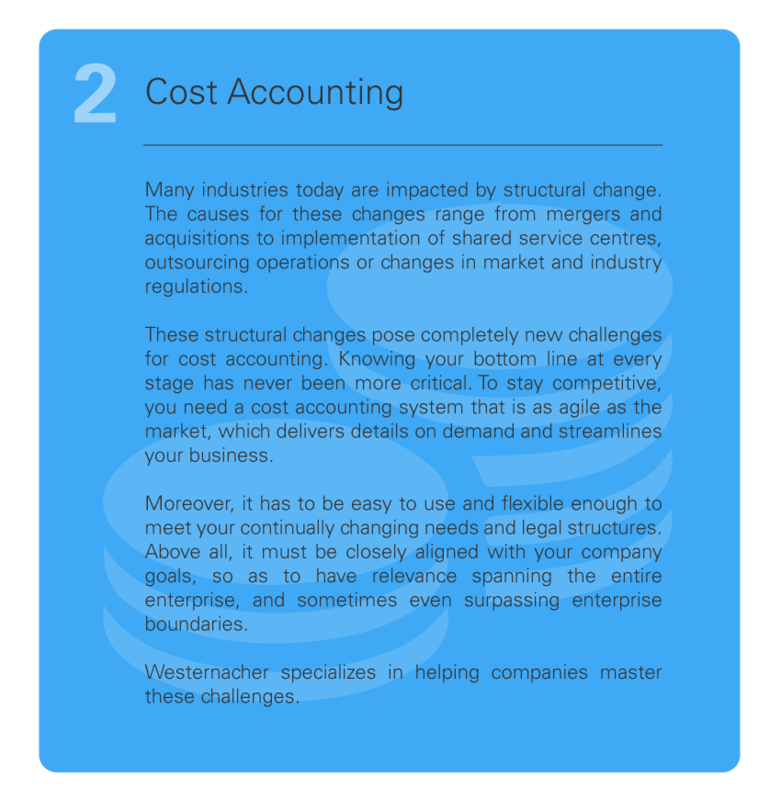 With highly qualified consultants and many years of operational and IT experience, Westernacher can help you to profitably manage your assets. Are you delivering top class customer satisfaction? Pressure to grow the business and minimize the costs while delivery superior customer service has also hit Sales and Service Organizations. Sales and After-Sales Services are of the most critical processes of any company. SAP Sales and Distribution (SD) and Customer Services (CS) helps to optimize your sales and service processes by automating processes, starting from quotations, sales order, delivery, billing and customer service orders tightly integrated with financial and other logistic components such as PP or MM. Westernacher covers end-to-end business processes and supports you to improve performance and enhance services in order to strengthen customer loyalty. Production Planning is an integral part of the logistics function in SAP ERP and is fully integrated with other SAP applications as Materials Management, Plant Maintenance, Sales and Distribution or Financials. Every business that has a manufacturing operation will have implemented some level of production planning functionality to ensure that finished goods can be manufactured at the necessary time for customer’s sales orders to be delivered. Westernacher supports you with the integration of SAP Production Planning and detailed scheduling into your SAP environment to achieve the best possible customer service while at the same time reducing costs and getting full visibility into all production processes. Portfolio management enables organizations to optimize resources in support of the most strategically significant projects and programs. Organizations often find that managing a capital expenditure program that meets regulatory requirements, supports environmental protection, and still delivers competitively priced, high-quality services to customers, can become a formidable challenge. A systematic and proven approach to project manage­ment helps companies to develop the processes, organizational structures and technology needed for enterprise-wide project control. For multi-project or portfolio management, complete integration with the existing ERP environment is highly desirable to ensure the coordination and timely availability of all project data. Westernacher can help you increase ROI by enabling a clear view of your project portfolio. We help client organizations to integrate project portfolio management into their existing ERP environment through SAP Project and Portfolio Management (PPM) or through tailored solutions as our pre-configured solution ipm based on SAP ECC Investment Management (IM) and Project Management (PS). 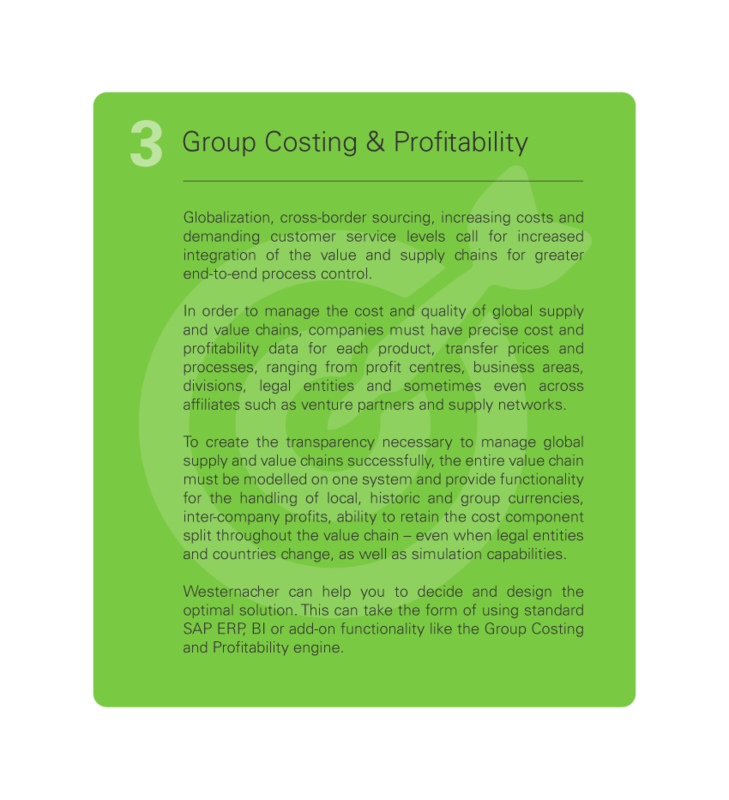 Globally optimized Supply Chain Management is quickly emerging as a reliable means of realizing better business potential, reducing costs and increasing revenues. SAP Material Management (MM) supports the procurement and inventory functions occurring in day-to-day business operations with many aspects such as purchasing, goods receiving, material storage, consumption-based planning, invoice verification and inventory. It is fully integrated with other SAP modules such as Finance, Controlling, Sales and Distribution, Quality Management, Plant Maintenance, Production Planning (PP) and Warehouse Management (WM). Westernacher supports the seamless link between these activities and functions involved in creating products or services which starts with your suppliers and ends with your customers.